Hyrule Warriors and now Hyrule Warriors Legends aren't short of interesting choices for playable characters, and now we have another intriguing addition on the way. It was confirmed during a Wondercon panel that Marin will arrive in the Summer's Link's Awakening Pack. You can see some character art from the reveal below. Nintendo of America also shared some other snippets from the panel, such as concept designs for Linkle and a cut bit of storyline that features the new character with Tingle. Why that was cut will be a mystery for our times - check out Nintendo of America's Twitter feed for all the posts. In any case, are you pleased that Marin's coming to the game or rather baffled by the decision? Let us know. I'm going to have to get the season pass for 3ds. Legends is really good and I'm enjoying it so far. I hope she calls down a Wind Fish on some fools. Awesome, was hoping (and figuring) she'd be the Awakening character. Nice, but interesting choice for a playable character. Still Im glad to see her on the roster. With Medli being included Marin's not that that far off. Calling that the Postman will likely end up a character at this rate. I very glad that Link's Awakening is finally getting some love, it's long overdue! So excited to see Marin! I love Marin, so glad she's going to be in game. 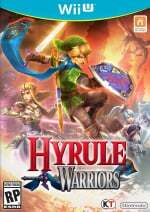 This is the DLC that sold me on another season pass for another version of Hyrule Warriors. Ah, Link's Awakening. By a long shot, one of my favorite games of all time. Beautiful story, awesome gameplay, just...perfection! I was at Wonder Con (and will be again today). I screamed and cried over this news. My favorite character from my favorite Zelda game. it's just nice to know that maybe, after the end of Links Awakening, she went on fun adventures, and this is one of them. What if you could play as Epona? That'd be interesting. @Wallkick03 Epona has been a weapon for Link for a long time. I really wish to get the season pass but I don't have a New 3DS so I can't fully enjoy the game and Wii U only get new characters and weapon with nothing else so going for Wii U season pass feels like a rip off. But if you could PLAY as her as a separate character. I know it would be unlikely, but it would be interesting to see. This is a DREAM come true, amirite?!?11?!!?! @Nintenbomba128 I just want the Groose to be set loose! @allav866 Medli is separate from the wind waker pack. All the packs have characters originating from those games. So it's probably safe to say that the Groose will not be loosed. It's ok I know your pain. Poor Gamexplain, no Link's Uncle riding the Windfish then. I've not played Link's Awakening yet, so I'm not particularly bothered with this character. Hyrule Warriors Legends and Link's Awakening have both been added to my very long list of games that I should play at some point. That's what I love about Hyrule Warriors - defeating huge legions of enemies and it being a HUGE love letter to The Legend of Zelda. Give me Groose, or give me death! @crimsontadpoles Hey, we all have em. Damn it I said I was done with this game but now I'm gonna HAVE to come back. MARIN!!!! LINKS AWAKENING!!! Total favs. Great to see this love for LA! it seemed abit obvious that they'd choose marin, i mean who else would they pick? Bow wow? I would like Linebeck, GROOSE SO HE CAN BE LOOSE!...Byrne, Zubora and Gabor, Kaepora Gaebora and lastly a phantom, but from what I can predict we will get Linebeck, Ravio, and Yuga, would be NOICE if the game done well that they would add more packs like oracle of ages/seasons, minish cap, Skyward sword, new Zelda, or anything else. Aww, I was hoping we'd get the Shop Keeper for the Link's Awakening character. @crimsontadpoles links awakening is a must-play. if you're dedicated enough, you can beat it in a day (took me 10 hours for a recent marathon play through). YES! My favorite handheld Zelda. Glad to see it represented. Darn it! I didn't want this before, but now I kinda do. Marin is my favorite LoZ character! Why can't $$$ grow on trees?! Loving the fan service with this. Link's Awakening is a gem that doesn't get quite enough love. Hoping for Lineback next personally. Does this mean she's in Zelda wiiu? Still waiting on Groose. But any Link's Awakening representation is good representation. I LOVE the updated design for Marin. I cried when the confirmation came in last night. She's my favorite character of the series. One of my favorite characters ever, period. July cannot arrive fast enough for me. Awesome! Still haven't even tried the game out yet, haha. I need to play it. @shaneoh Farore is easy, give Lana a green palette swap. She has a book. Yeah I was thinking the Book of Secrets, her artwork in the oracle depicts her as holding a book. Although personally, I'd rather the oracles not be copies of other characters with a different skin. @shadjv She doesn't play an instrument, but she does sing. I'd bet on her having seagulls as a weapon. @allav866 Medli is actually a free download for both versions of the game as of now, she doesn't require the Master WW pack. Awesome, can't wait to see how she plays. I agree with many others, if Groose doesn't get let loose, I don't know what nintendo's doing. I am happy with the characters so far, especially tingle getting some love. But I need Groose. I would really want Vaati, but he's so unlikely I'm not gonna waste my time. Minish cap being my favorite Zelda game, thus my second favorite game period, I would love at least a pack that contained a character from it. Owell. For a minute there I thought the article said Malon. I'm not disappointed, but now I also want Malon, lol! Yeah I wouldn't mind Malon either. @GoldenGamer88 Screw GameXplain. Nintendo Life is so much better. Marin's a solid choice. I was hoping (irrationally) for the Wind Fish, given some of the other quirky character choices, but one of my favorite aspects of Hyrule Warriors is the highlighting of the series' sometimes under-utilized female characters, so this is a plus. I haven't played Link's Awakening in a good fifteen years, though, so it might be time to replay in anticipation of this DLC! Oh my goodness, I hadn't considered the Postman! I hope he gets added to the roster. Link's Awakening totally deserves a remake. 2d style like 4 swords adventures or 3d like wind waker would be great in my opinion. Its an old enough game that many new players never got a chance to play it. It is on 3ds virtual console just so you know! My favorite 2d Zelda ever!